Hsi Chun; Right: Super Textile President, Alex Lo. 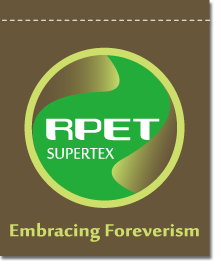 Super Textile devoted the R&D of recycle pet early in 1997. Over one decade dedication, our achievement is affirmed, which also enables us be one of the environmental heroes 2010. The <Global Views Monthly> with Yahoo as the host organization, review all 121 candidates recommended by public; after the editorial department audit and investigation and with expert’s opinions, 15 heroes were selected for the second session of the Taiwan Environment heroes. UMC, 7-Eleven, Yulon Motor – LUXGEN are the heroes of this year. Last year, the first 15 heroes were selected among 165 candidates, Tzu Chi foundation – Master Cheng Yen, Jian You Chin –the former minister of Environmental Protection Administration, Taiwan, Philip - Taiwan are the heroes. Our efforts enable the recycled pet bottle to be made into fabric, instead of being derived directly from petroleum byproducts, the fabric fiber are extracted from recycled PET bottles. The bottle top, after our research and development for years, can be collected, cleaned, and made into the pallet. Recycled bottle became to team player shirt, it gets renowned in the World Cup 2010. There are nine of the 32 teams in the World Cup were knitted out in fabric made from Taiwanese recycled bottles. A pallet of 120 cm x 120 cm is made out of 7,300 bottle tops. Super Textile gives rebirth to the pet bottle which has been in a much more environmentally friendly way used.